Well today was one of the best runs, if not the best run I have ever had. I just cannot believe this feeling every time a race is done. 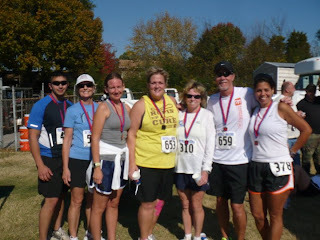 For starters I am so happy that I went to run this race. I was teetering with the idea of running it or not. I knew I could do the distance but didn't know why I had to race to do a long run. Well, I am so happy that I did it!!!!! I was a little bit nervous about this once I got there this morning, I don't know why because I knew I could do it, but I wanted to have a good time. I don't think the start line announcer was helping anything either...he started going through the warnings, "participation of this even can cause heat exhaustion, blah blah blah, and all the horrible things that can happen to you if you are not properly trained." Hello dude, some of us are scared! I also thought it was going to be cold and then warm up and I would not have anywhere to shed layers. Well it started off just right and I got to take my jacket off before we started. The weather was great the entire run, nice and warm but not to hot or sunny. I ran the first couple of miles without doing my 4 and 1 pace like I had planned. I don't like to stop and walk before the first mile is over, I can run further than that, but I knew that if I ran out to fast and too hard that I would not be able to complete the race in the time that I was hoping for. I ran the first 7 or so miles by myself and was kinda getting bored, then I found a friend. We ran about 2 miles together and got separated. 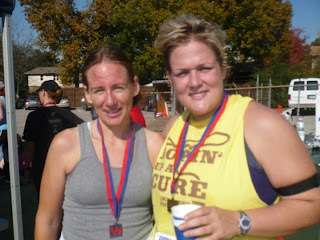 Then I found another friend and ran with her for about another mile. It was nice to have someone to talk to since that is how I am used to running. I must also mention that I ran with a man that was 89 years old and hold the AL record for half marathon time in his age group. We started off for about a mile together and it was nice to hear him talk about running. The first time I thought it was getting tough was about mile 11. I was really starting to hurt about that time but was so close to the finish. I walked a little bit there without doing my 4 and 1 and then picked right back up once I got my legs back under me. Then at mile 12 the downhill!!!!! Most of the race was completely flat which is wonderful, but there is something special about a downhill at the last mile. By the time I got to mile 12 I knew I was not going to finish in 2:30 but I was going to have a much better time than my first half. I ended up crossing the finish line somewhere at 2:40:?? I was thrilled...like more than I could ever explain. That was my personal best by 35 minutes. That is a gain of 35 minutes in about 8 months. I couldn't be more thrilled. 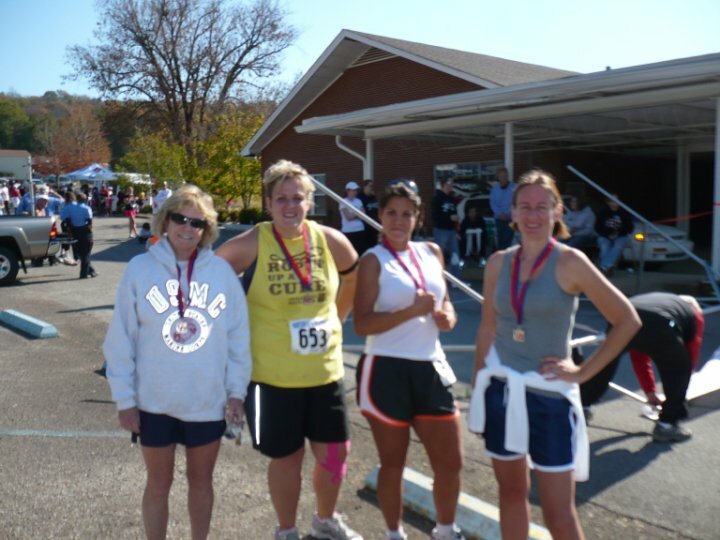 I know I could have not gotten that kind of improvement if it hadn't been from the support of all my running buddies. 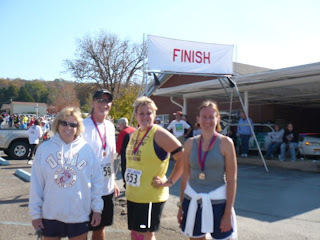 They have been so encouraging from the time I said I was going to run the full marathon. I just love those guys. I was also thrilled to see so many people from my town running this race. It is great to see some familiar faces when you have to pass people. I love the cheers from people I know. I also have to brag on my blog readers! I had such a sweet girl cheering for me out on the race field. She told me she was coming out to cheer for a friend but would cheer when she saw me. Bless her heart...she made me a sign! It was so nice, she was even cheering for me as I came up to the finish line. After the race the idea was to run 5-7 more miles. Well I didn't. Everyone kinda bailed on the run except for my usual running buddy and her daughter. I felt bad going with them because they are both really faster than me so I thought I would slow them down too bad. I didn't have much gas left in the tank at the point. Instead of running I sucked down a piece of pizza and a gallon of water and Gatorade. It was quite possibly the best piece of pizza I have ever eaten in my life...and I have eaten a lot of pizza. After the run I took a trip over to Fleet Feet to get a new pair of shoes. I have worn my shoes into the ground and have tried to time it just right so I can get them worn in before the full but not worn out. Again I had a great experience and have to brag on the guy that helped me. I think his name was John! He fit me in new shoes after a race, sweaty feet and all. I ended up getting the same shoes that I had before, if it ain't broke, don't fix it. Once I got home I had a little yard work to do, then out to dinner. I don't know that I have ever felt like I could do anything after a race, much less yard work. I am a little bit sore in the hips and knees but still feel great and I am enjoying the runners high....6 hours later! All in all it was a great run, and a great day. Now my body is ready for bed, I don't think anyone will have to rock me to sleep tonight! Thanks guys for all your kind words and encouragement. Cant wait for the next one. Oh and by the by, I have some race pictures coming soon. A friend took them on her camera so I have to wait till she emails them to me. Great job, Emily! I am proud of you and the progress you've made - keep up the good work and the inspirational blogs! it was a great day! we all did really well! my toes kept hurting the rest of the day and evening! 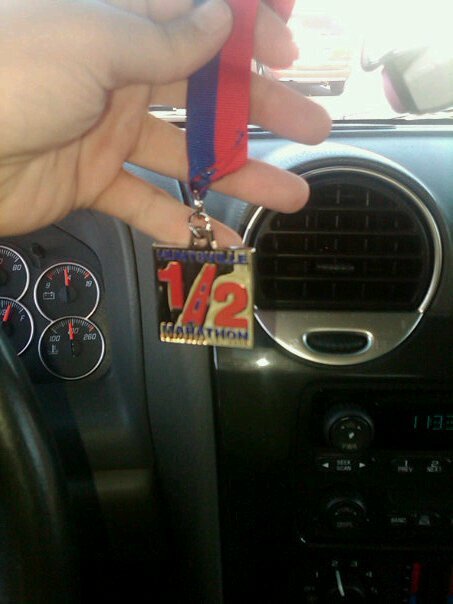 Congrats on your half marathon! That's a great time! 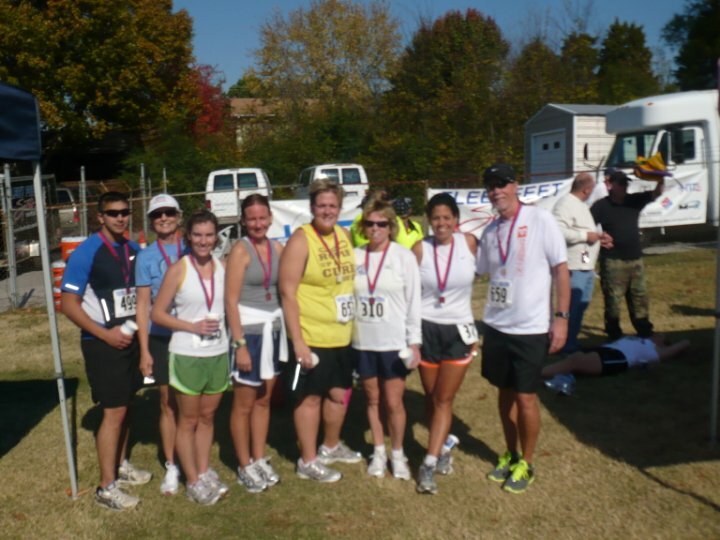 I am a friend of Anna Catherine's, and I actually walked in my first half marathon that same day in Nashville! I also have a blog, too! Check it out! It's www.nashvillesmelrose.com. Melissa Im so sorry it took me so long to respond to you. So happy for your first Half, I promised myself I would only do one and now Im addicted and cant wait to do another and another. Hope the running bug hits you too. Great Job!